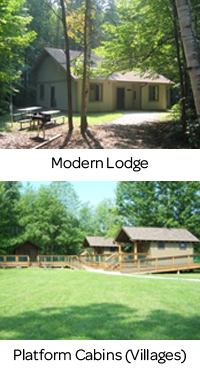 Troops that want to come Troop Camping at Hawthorn Hollow can rent either Lodges or Villages. Lodges can accommodate 22-32 people. Villages hold 20 people each, and there are four Villages on site. Each add-on activity is approximately two hours and is $5 per girl. Add-ons require a minimum of 10 girls. Once your camping registration is completed online, then contact us to book add-ons. Add-ons are based on staffing and available on first-booked basis. The registration deadline is 2 weeks prior to your visit. For any questions, please email outdooreducation@gssem.org.